Double act: The KDK sisters Keira (left) and Dairine Kennedy with model Lauryn (centre) wearing two of their Ha’penny Bridge scarves. Giovanna Borza with model Lauren wearing pieces from her collection. Sophie Rieu, with model Lauren wearing pieces from her new collection. David O'Malley with model Lauren. Rebecca Marsden and model Lauren. Fashion peacockry with a purpose is what I call the ARC show, an annual style extravaganza where emerging and established designers and milliners showcase their latest work, with proceeds from the gala show going to the ARC Cancer Support Centres which offers a range of free support to those affected by cancer. With 26 designers and milliners showing and over 800 attendees expected on the night, the ARC show, produced by Eddie Shanahan, constitutes the biggest show of its kind in the country. 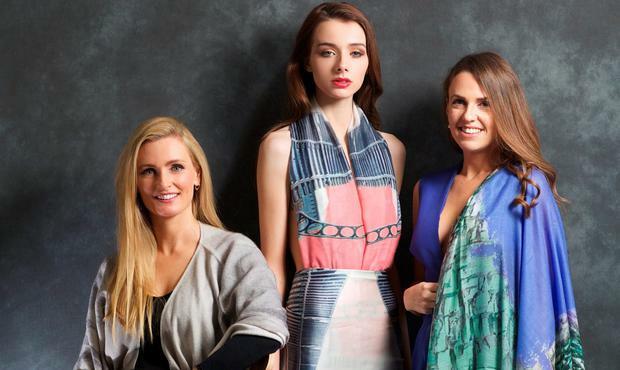 UTV Ireland presenter Claire Brock will be guest of honour on the night and Ireland's leading luxury store Brown Thomas has also come on board for the third year to show its continued support for Irish design. Brown Thomas will also donate some exquisite raffle prizes and in addition, No 7, who did the make-up for our shoot, will provide a 'goodie bag' for all attendees. Full details of where to get tickets are on the next page. Under the theme of Celebration, a spectacular millinery collection has been created especially for the show by six milliners - Martha Lynn, Aisling Ahern, Margaret O'Connor, Elaine Keogh, Aoife Kirwan and Davina Lynch - promising an exquisite display of colour and creativity. It's a night for newness and French-born Kerry-based designer, Dephine Grandjouan, who has specialised in bridal and evening wear, will be launching a new ready-to-wear cocktail collection at the show. The full list of designers showing is: Aisling Ahern, Giovanna Borza, Jill De Burca, Helen Cody, Coletti , Ruth Duignan, Blaithin Ennis, Delphine Grandjouan, Heidi Higgins, KDK, Elaine Keogh, Aoife Kirwan, Derek Lawlor, Davina Lynch, Martha Lynn, Margaret O'Connor, David O'Malley, Emma Manley, Rebecca Marsden, Caroline Mitchell, Lucy Nagle, Niamh O'Neill, Sophie Rieu, Lisa Ryder (accessories), Mona Swims and Mariad Whisker. Model's shoes: Supplied by Brown Thomas include Aquazzura peach suede shoes, €665 (on previous page ) and Celine white leather peep toe with silver blocked heel, €720 (on this page). Sliders trimmed with grey Mongolian wool are by Giovanna Borza. Chairs from CA Design, Dunville Ave, Dublin 6.